Glazed Over Beauty: 2 Years. 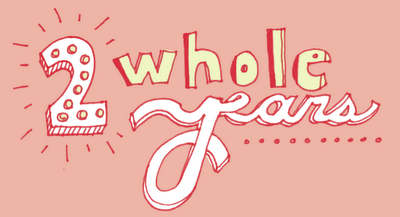 I never made much of a fuss about my one year blogaversary. I wasn't blogging super regularly, and I didn't interact much with other bloggers. It just sort of came and went and even I hardly noticed it. But today, on my blog's second birthday, I feel it's worthy of celebrating. Glazed Over has come a long way since the very start. I've come to "know" so many bloggers through my own blog, and have stumbled upon so many new products thanks to reviews and recommendations from readers and bloggers alike. I've been exposed to cool new opportunities (like this! ), and I've really come to love my little space in this big wide internet world. Thank you so much for reading my posts and supporting my love of all things beautiful. You guys make this hobby of mine so much fun, and it wouldn't be the same without you. Thanks, Jenna! :) And thanks for reading!